What is the meaning of victory of Farooq Abdullah from the Srinagar constituency where not even 7% votes polled. In many of the booths merely 2% votes were polled. I know there are past precedences of such a situation in at least three Indian states when people boycotted and government determinedly went for polls and were ‘able’ to form governments. But when the world is watching and we claim to be the biggest democracy of the world, shouldn’t it a matter of deep concern. Can any democracy of 7% vote would legitimise. Farooq Abdullah may enjoy Lutyens housing complex as a senior leader but the credibility of the political parties at all time low in Kashmir. You may win elections but you are loosing people. How to win over people ? Has there been any credible attempt by the government. Kashmir seeks serious answers from us all. 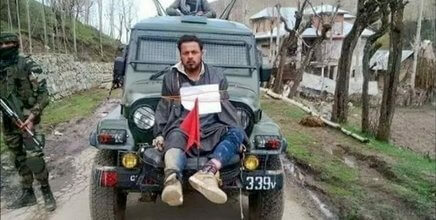 The outrageous video of a Kashmiri youth being taken as hostage or human shield by the armed forces is a dangerous act and will further alienate people in the valley. We know the forces are under deep stress and so are the people of kashmir who have been facing deep insecurities and all kind of difficulties for past so many months. I am happy that Lt General H S Panag, a highly decorated officer of the Indian army, who is retired now, expressed deep shock and anguish over it. Let us acknowledge that life is not normal in Kashmir despite a ‘çivilian’ government. It is easy to blame the army but the fact is they are just doing their job. Their problem is that when they are send to Kashmir or north east, most of them go with a mind as if they are entering into a ‘dushman ki territory’ or énemy territory’. Most of them do not have any understanding of the Kashmir conflict or the issue of aadivasis or north east. As they enter into these areas, every dissent and protest become anti national, a foreign agent. In terms of Kashmir, anti national has a direct connotation which means pro Pakistani and the result is well known to us. Without understanding the deeper political issues of the region, forces will not be able to control the situation. One need to realise that these are not the old age wars where you can conquer everything by guns and ammunition but by winning over the heart of the people. These days it has become more so because of the uncontrolled tongue of political leadership. It is the failure of the civil administration and political leadership of the country which continue to treat the kashmir issue as an administrative one ignoring the historic reality of the entire issue. Political rhetorics and jargons will not take Kashmir further. The unfortunate part is that the politicians of the day has used Kashmir as a political tool to create hatred and phobia among their respective constituents without understanding the complex issue in all its sincerity. The PDP-BJP government in Kashmir today has no control over the situation. They remain a government on paper as violence continued. Mehbooba Mufti does not have a stature of her father who could have definitely spoken to all the groups. We do not have a Sheikh Abdullah who was a power house and had credibility among people. The other leaders including his son and grand son Omar Abdullah remain isolated today. The entire situation seems to be being looked after by a set of ‘experts’ who perhaps despise any political person of the state. It has resulted in the entire issue being discussed and decided by the self proclaimed anti terrorism experts’ and those hypers who want to discuss the entire problem in Indian Pakistan binary without speaking to local Kashmiri civil society and political leadership.The problem with the Kashmir experts is that they want to isolate all others and addressing the issues to Non Kashmiri population in the Indo Pakistan issue. They have little time for introspection and the only thing they advise is more arms, more forces and more power to military. None of them is ever bothered about how to initiate a political process. Though there is a civilian government there but its credibility is lowest and it is also isolated. Delhi’s media and expert look down in suspicion to every political person and civil society activists, media from the state, Once the political parties and civil government fail, who does the government initiate the negotiations. It is here the maturity of a political leaderships counted as how much liberal it is in countering such a situation. In the age of whatsapp and internet when everything is now coming out in open, it is important for political leaders to show their better side but for Hindutva supporters, Kashmir is a bigger political agenda for elections. The ranting over Kashmir is so high pitched which comes to how the Pandits were forced to migrate to how our women were molested and raped by the Jehadis. The emotions on Kashmir in the rest of country are too high and help in consolidating one people against its own minorities named as Muslims. It is sad to see authors, celebrities, diplomats joining debates on Kashmir in a very parochial way. It looks more as if are more worried about a geographical landscape without an inch of sensitivity of feeling towards the fellow Kashmiris. We talk of Kashmiri Pandits but forgotten completely the Muslims in Kashmir who have faced the harassment, intimidation all their lives. Why it is politically correct to speak of Kashmiri Pandits but completely ignore the issue of Kashmiri Muslims ? The whole propaganda and perception developed outside Kashmir is that Muslims are not pro Indian and only people defending India is Hindus particularly Kashmiri Pandits. This happen when we build our perceptions from those for whom the land mass is more important then the people in the region. When you want to know about Kashmir, you can not ignore the past, the history and crime perpetrated on kashmiri subjects by different rulers including Dogra regimes. For years, we have been fetched in our mind how much Indian government is providing subsidies to Kashmiris and how everything is so cheap and easy in Kashmir and how each one of them is a traitor Pakistani agent. In the 1990s when the Ram Mandir movement grew and we had a few high decibel ‘loudspeakers’ who became ‘heartthrob” of the people used to describe Kashmir situation as ” atrocities” committed on Hindu families in general and women in particular”. Kashmir became a highly hell zone in the perceptional ideas of middle class Hindus where everything is anti Indian and our forces are there to defend the people. Such issues can not be handled in a surcharged atmosphere but with cool mind and acknowledging that the history of Kashmir was complex and need a careful understanding. That nothing can be resolved in the region without taking into account the people which means inclusion of the leadership of Kashmiri Muslims in the valley. It can not be just political leadership but also academics, civil society and other actors. Just by terming every one as anti national we are pushing the whole valley into the brink of disaster. If the political leadership is discredited then who are you going to talk ? The role of the armed forces is to protect our borders. They cant be used for day to day administrative work which is the job of civil administration. The army jawans come from diverse socio cultural background and living in deep stress. For them obeying the orders from the higher up is the most important thing and therefore J & K for them become an alien area. Most of them come with their own understanding and follow the orders. With active militancy in the region, it become difficult for them to manage things. Whatever is happening today in J & K is the extensive usage of army which is not advisable in long term. Unfortunately, there are many self proclaimed nationalist expert who want to make us believe that we should do what Donald Trump did in Afghanistan ? How can you not feel offended when some one want to suggest that the hapless man who was taken as human shield by the forces in Kashmir was not the first of its kind incident and Israel have been doing it for long ? Does not it look shocking when we hear people spreading message to send Yogi Adityanath to Kashmir. The connotation of such messages is clear that Kashmir is a Muslim problem and it need to be handled with iron hand. It is with that idea that government knows well that whatever the armed forces are doing, has got ‘support’ from ordinary masses. It look as if the government is acting ‘decisive’ in Kashmir because it is not állowing’ secessionists to stand. But if these issues were that simple, the problems would not have been there. I would not blame on army for the disturbing situation in Kashmir but on the political leadership which continue to ignore the need of a political dialogue. Can we rise up on the occasion and engage with Kashmiri people and all the stake holders including Ladakh, Jammu as well as other parts of Pakistan Occupied Kashmir. We must remember that Kashmiris have been a peace loving people but the antipathy of our civil administration and lack of will among political leadership has created such a situation today that most of the youths in the valley seems to be completely alienated? The government need to think beyond administrative mechanism ? Farook Abdullah’s win may not bring any result as at the moment both the parties of Kashmir, PDP and National Conference are at the lowest of their credibility and there are no other political groups in the valley who the government will engage for a negotiations. Is "Hindu Rashtra" good for Hindus?